This Type of massage originated about 2000 years ago has elements of Shiatsu, Reflexology, Chinese Massage. Thai Reflexology Foot massage as practice in Thailand is an ancient therapeutic technique, with origins and secrets passed down through generations by the Buddhist monks of the Thai Royal Palace. Working with the feet, lower leg and knees, this 2000 year old, highly reputed session frees up blocked energy within the body's many sens lines (Thai-based meridians) to produce a deep and unique feeling of balance, relaxation and well-being. Thai Foot Reflexology Massage is done while you relax in a chair or on a massage table. Thai Foot Massage involves hands on massage, along with the use of a rounded wooden stick with lotion or oil to stimulate the reflex points or energy lines. Using pressure points on your feet that correspond to different organs slight pressure is applied to feet and lower legs to stimulate organs and relieve toxins. The pressure points which reflect a complete map of the entire body and all its organs. By manipulating these different points the body and the mind are stimulated to restore the balance in that particular zone, and thereby throughout the whole body. This massage is for overall health benefits and boosting immune system. 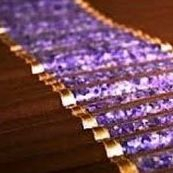 This massage is done while you are laying down on a infrared amethyst crystal biomat for extra benefits!